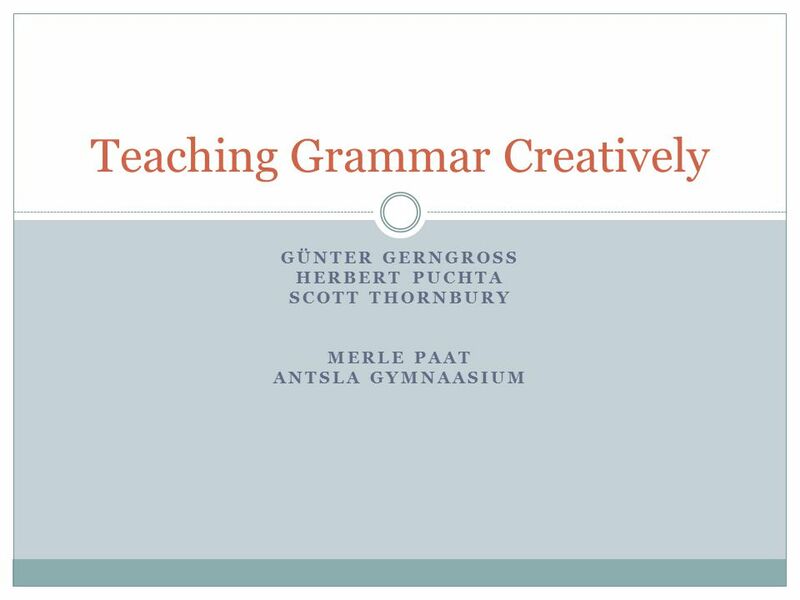 GÜNTER GERNGROSS HERBERT PUCHTA SCOTT THORNBURY MERLE PAAT ANTSLA GYMNAASIUM Teaching Grammar Creatively. 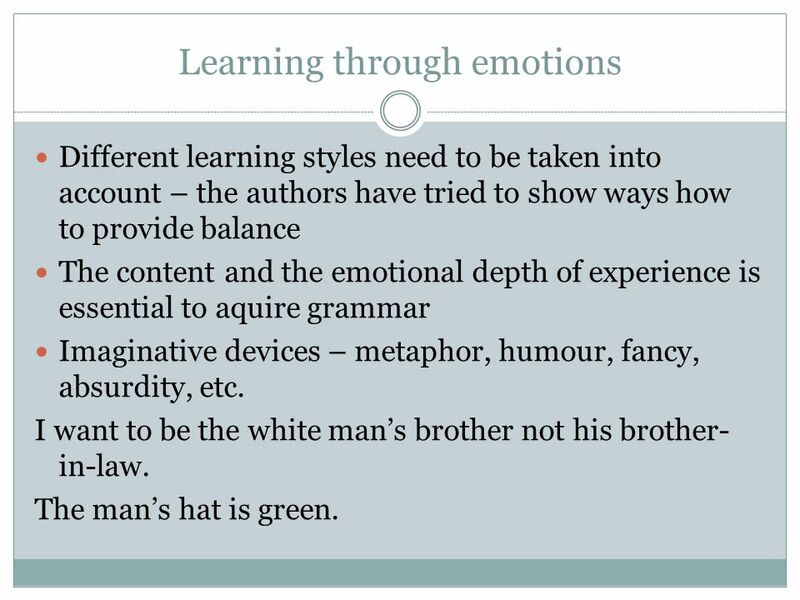 5 Learning through emotions Different learning styles need to be taken into account – the authors have tried to show ways how to provide balance The content and the emotional depth of experience is essential to aquire grammar Imaginative devices – metaphor, humour, fancy, absurdity, etc. I want to be the white man’s brother not his brother- in-law. The man’s hat is green. 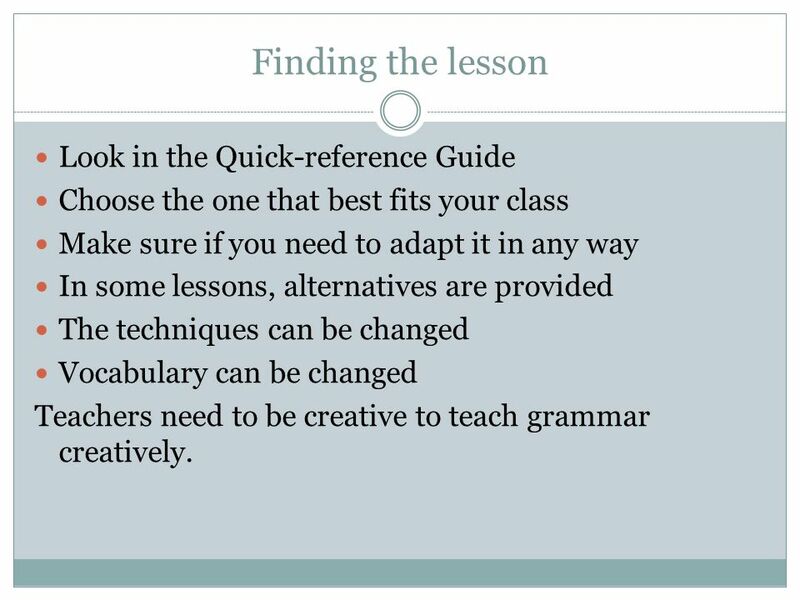 6 Finding the lesson Look in the Quick-reference Guide Choose the one that best fits your class Make sure if you need to adapt it in any way In some lessons, alternatives are provided The techniques can be changed Vocabulary can be changed Teachers need to be creative to teach grammar creatively. 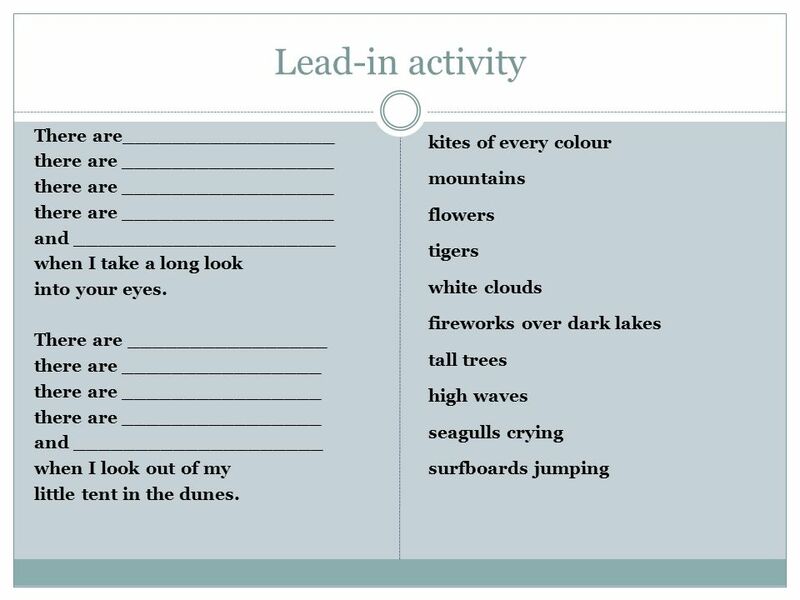 10 Key to lead-in activity There are flowers there are tigers there are tall trees there are high mountains and fireworks over dark lakes when I take a long look into your eyes. 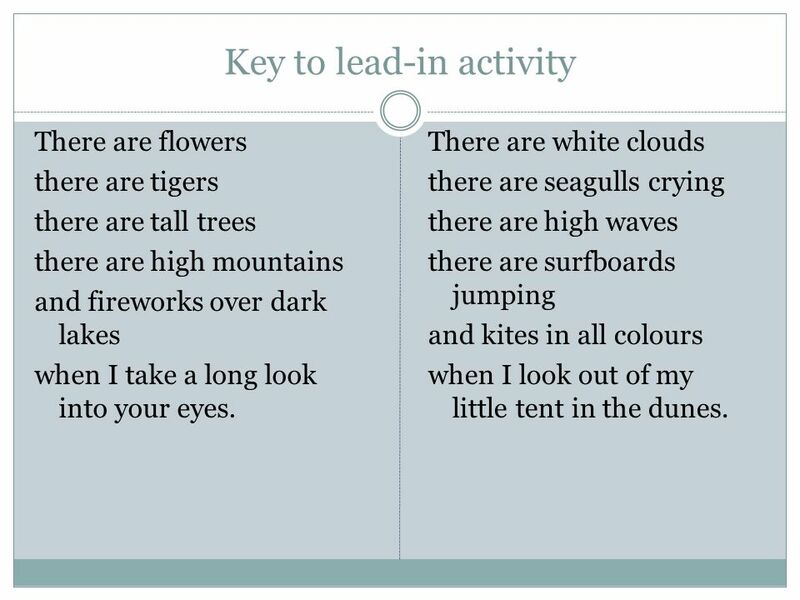 There are white clouds there are seagulls crying there are high waves there are surfboards jumping and kites in all colours when I look out of my little tent in the dunes. 12 Consolidation. 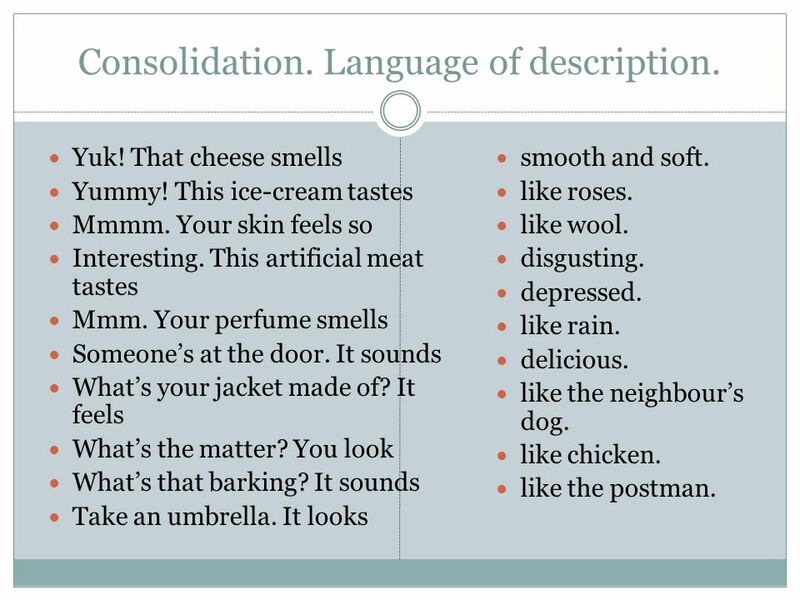 Language of description. Yuk! That cheese smells Yummy! This ice-cream tastes Mmmm. Your skin feels so Interesting. This artificial meat tastes Mmm. Your perfume smells Someone’s at the door. It sounds What’s your jacket made of? It feels What’s the matter? You look What’s that barking? It sounds Take an umbrella. It looks smooth and soft. like roses. like wool. disgusting. depressed. like rain. delicious. like the neighbour’s dog. like chicken. like the postman. 13 Do you mind..... 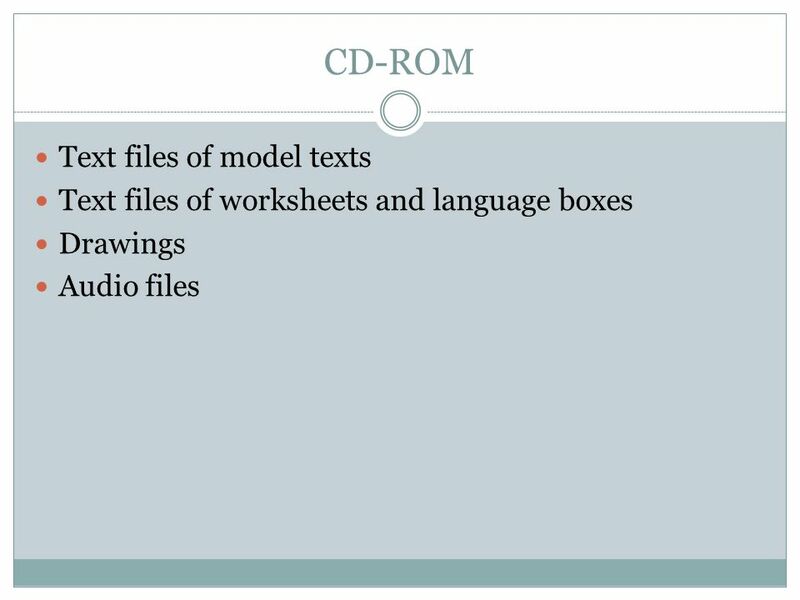 Presentation and reconstruction of the model text D _ y _ _ r_ _ _ _ _ m _ _ _ m _ b _ _ _ _ I _ _ _ o _ _ _ i _ a w _ _ _ _? D _ y_ _ r _ _ _ _ _ m _ _ _ m _ f _ _ _ _ _ _ _ _ _ m _ h _ _ _ _ _ _ _? D _ y_ _ r _ _ _ _ _ m _ _ _ m _ t _ _ _ _ _ _ t _ m _ m _ _ _ _ w _ _ _ I’ _ b _ _ _ _? D _ y_ _ r _ _ _ _ _ m _ _ _ m _ s _ _ _ _ _ _ i _ t_ _ t _ _ _ _ _? D _ y_ _ r _ _ _ _ _ m _ _ _ m _ s _ _ _ _ _ _ _ I _ _ _ _ _ _? W _ _ _, t _ _ _ w _’ _ _ h _ _ _ t _ s _ _ g _ _ _ -b _ _ b _ _ _ _ _ _ I d _ m _ _ _ n _ _ _ _ _ -m _ _ _ _ _ t _ _ _ _ _ _ _. 14 Do you mind..... 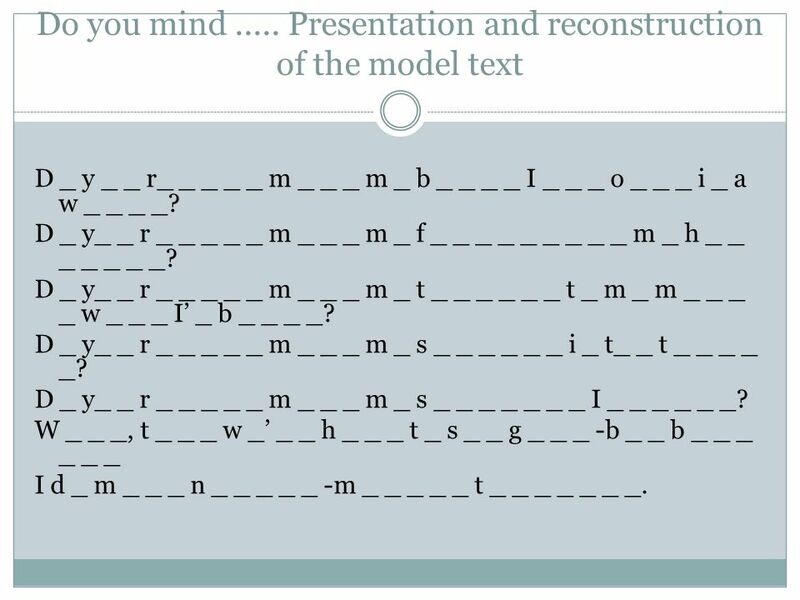 Presentation and reconstruction of the model text Do you really mind my being late once in a while? Do you really mind my forgetting my homework? Do you really mind my talking to my mates when I’m bored? Do you really mind my smoking in the toilet? Do you really mind my skipping lessons? 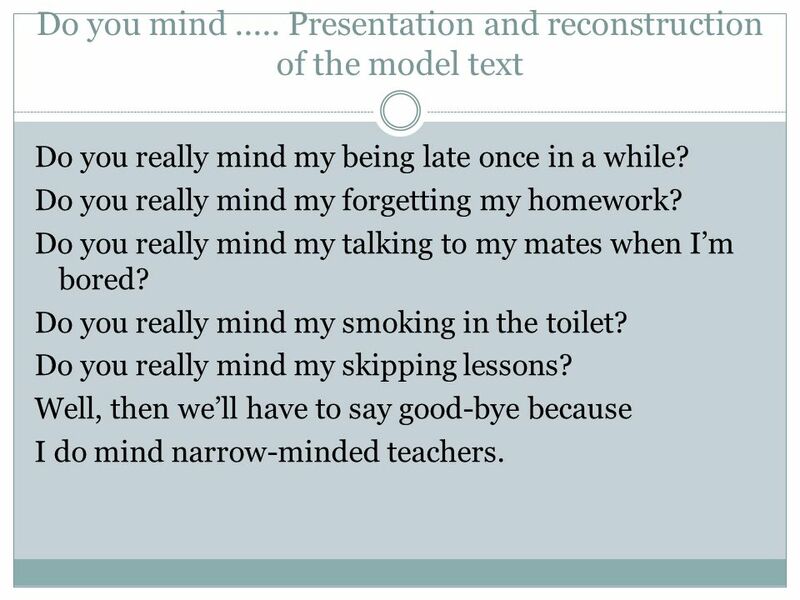 Well, then we’ll have to say good-bye because I do mind narrow-minded teachers. 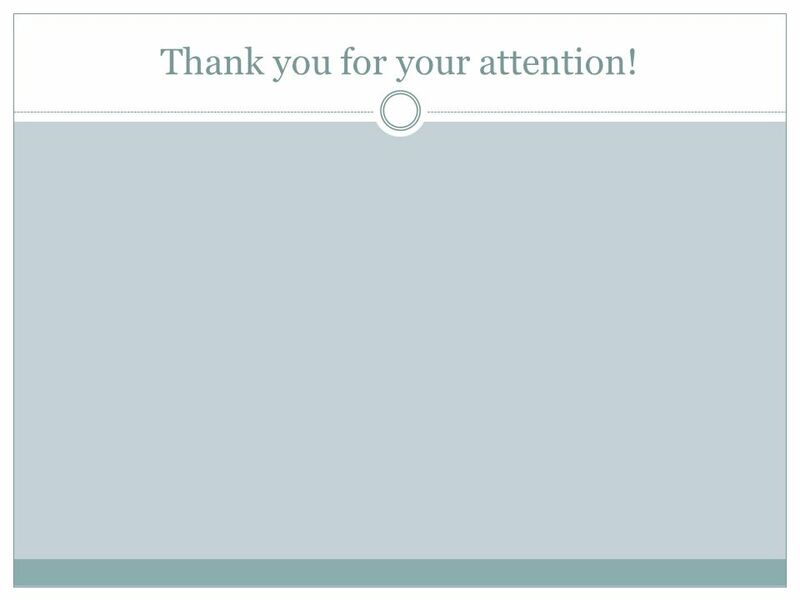 15 Thank you for your attention! 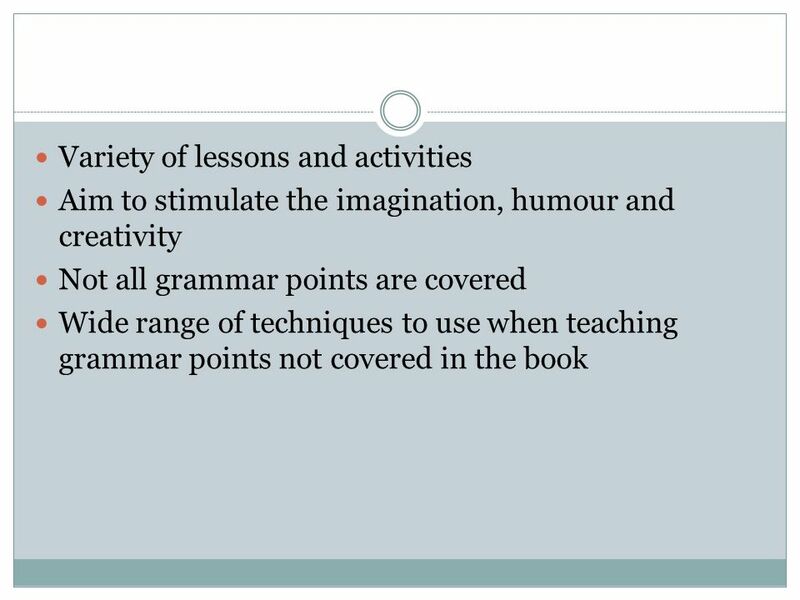 Download ppt "GÜNTER GERNGROSS HERBERT PUCHTA SCOTT THORNBURY MERLE PAAT ANTSLA GYMNAASIUM Teaching Grammar Creatively." 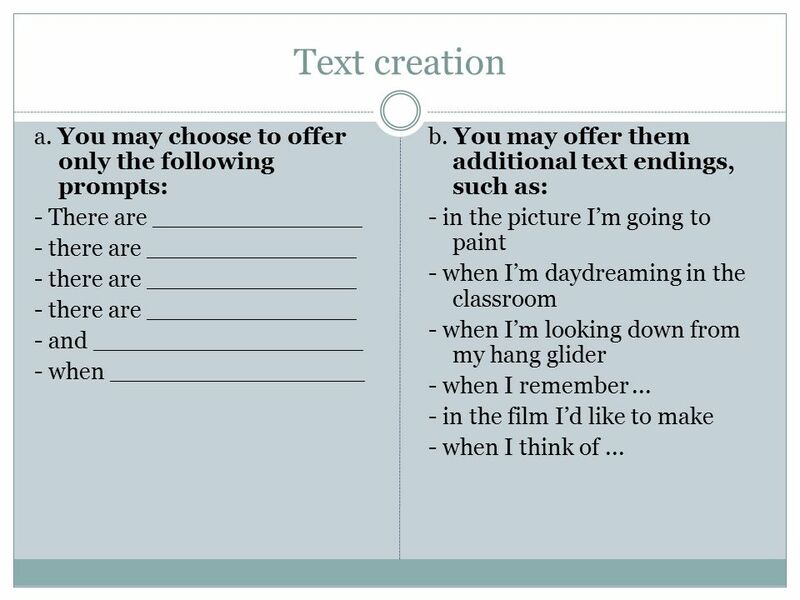 Adding Details to a Story Narrative Writing Lesson Craft Lessons page.30. Primer. All the students are in the bus. I am feeling sick. From Lesson Planning to the Managing of Teaching & Learning: Teacher Talk Desmond Thomas, MA TESOL ELLT1. Reading Night Welcome grade 1 parents!. What is it?. 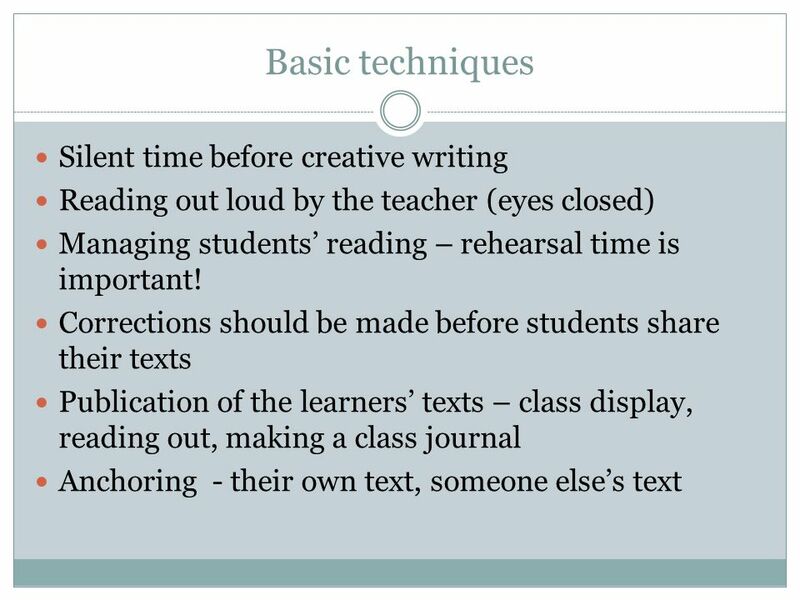  Create mental images while they read.  Use all five senses to help them create pictures in their mind  Think about what the character. Topic MUSIC VISUALIZATION DetailsAimsProcedure DETAILS Grade four Number of pupils : 24 Age range : ten Time : two lessons of sixty minutes Material. Thinking and Choices in the Art Studio Art Educators have unique opportunities to enhance student thinking and problem solving. 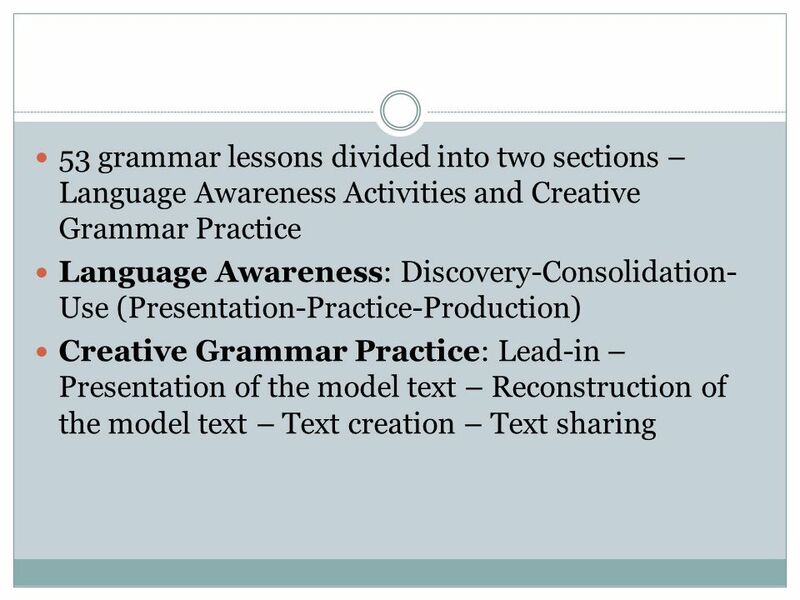 Reading Comprehension Skills and Strategies By: Alona Saada. Poet: The term used for an author of poetry. Stanza: Poem paragraph Line of Poetry: Single line of words in a poem. DOES NOT need to be a complete sentence! Reading and Writing in 4 th Grade K. E. Little Elementary. Rhyme Time with Dr. Seuss By: Sydney Satoski Teacher’s Page Objectives Given a passage from a Dr. Seuss book, students will be able to pick out rhyming.